T3 Bayside joins 3XN’s two residential buildings in the area, Aqualuna and Aquabella, which activate Toronto’s newest and most dynamic live-work-play community. 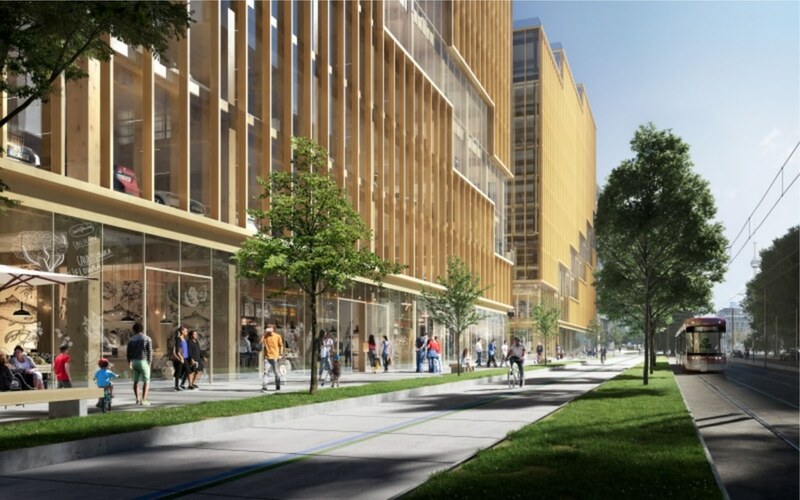 The new building and adjoining plaza will serve as dynamic visual and pedestrian gateway to the entire neighborhood, connecting residents and visitors to the revitalized waterfront. 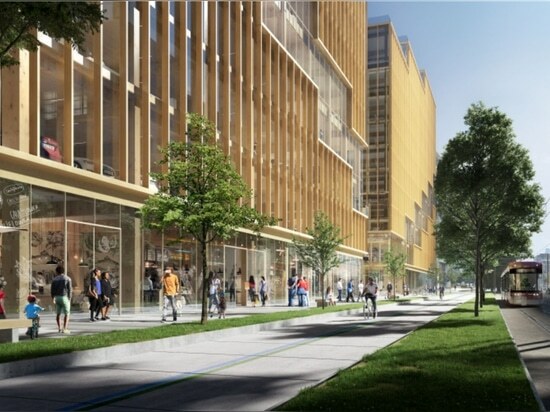 T3 Bayside is designed to reflect and emphasize the emerging neighborhood in which it sits, a community modeled around the intertwining principals of life, work, and play, offering a multitude of opportunities for the next generation of Torontonians. The building creates a continuously activated ground level, with abundant retail opportunities available on all sides. 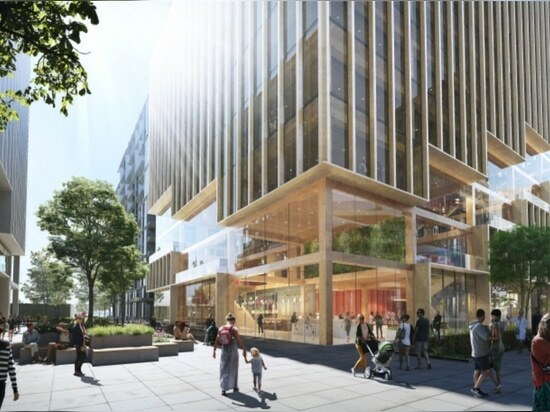 At the base of the building a new central plaza has been created, around which are additional stepped community and shared spaces, including exhibition and gallery spaces, flexible offices space and coworking facilities. 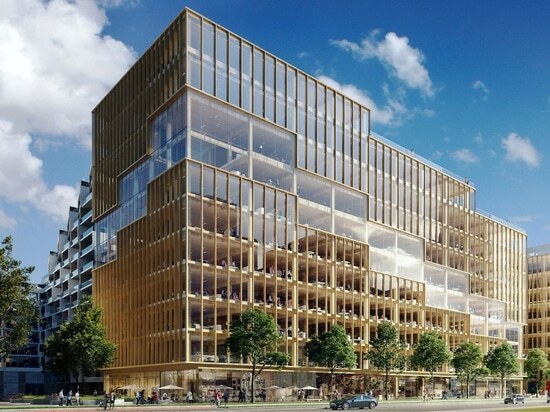 Located at the northern edge of the Bayside development, situated along Queens Quay East and flanked by Merchant’s Wharf, T3 Bayside presents an opportunity to enhance and enforce the existing master plan on multiple levels. Through a series of stepped roof terraces, the building strengthens and emphasizes the movement and heights of the existing master plan at either end of the site. The same terraces step downwards toward the plaza, a new urban gateway and focal point that invites visitors and residents alike into the Bayside community as a whole. T3 Bayside marks the entrance to the neighborhood, leading all visitors toward the new waterfront promenade and thus connecting the city of Toronto with Lake Ontario. Equal parts urban market, social space, and landscape, the new plaza is the public heart of the T3 Bayside project. Along the edge of the central plaza, corner lobbies, retail and café spaces are designed with flexibility and operability in mind. 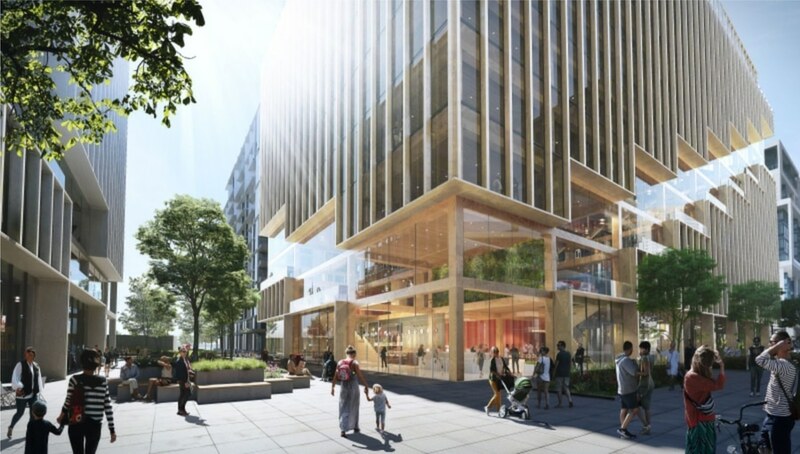 The building incorporates flexible event and community spaces that face the plaza on multiple levels, all of which can be used individually or booked together to facilitate various programming and events throughout the year. 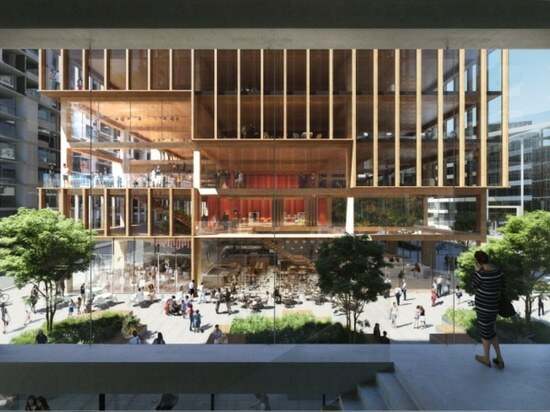 In this way, all activities within the space are visually connected to the central plaza, assuring that activity within the building is part of the exterior experience as well. 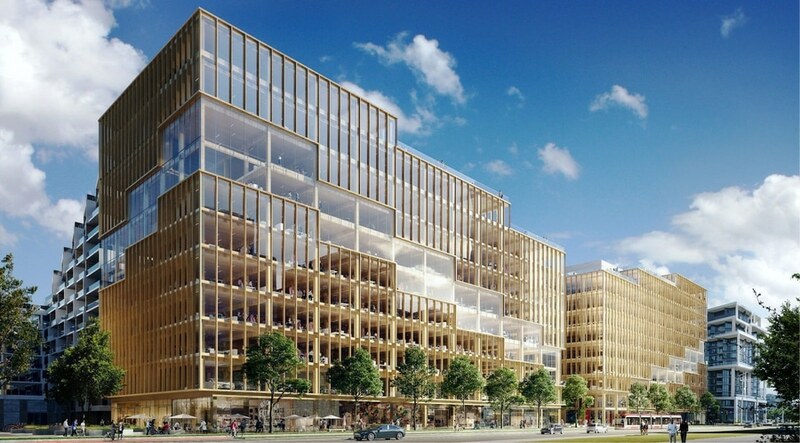 The materiality of timber defines the unique interior aesthetics and will also be reflected in the exterior of the building. Both the material and the shape of the wooden frame will ensure great acoustics. The use of wood, a breathable and absorbent material that allows the release of moisture, ensures a naturally regulated and healthy indoor environment. 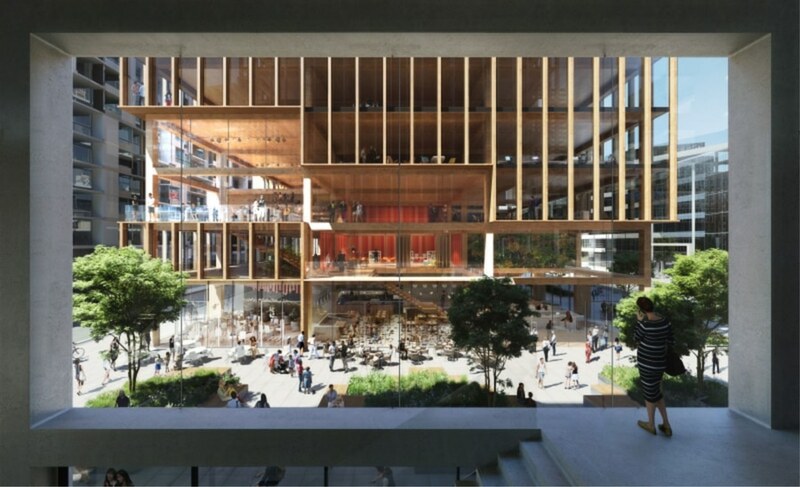 T3 Bayside brings together a flexible office space with a mix of coworking and community spaces, offering an experience that appeals to a broad array of tenants. The shared office spaces each hold the potential to combine intimate, single-height zones and social, double-height zones that suit ideas of coworking and are designed to accommodate a variety of programs. 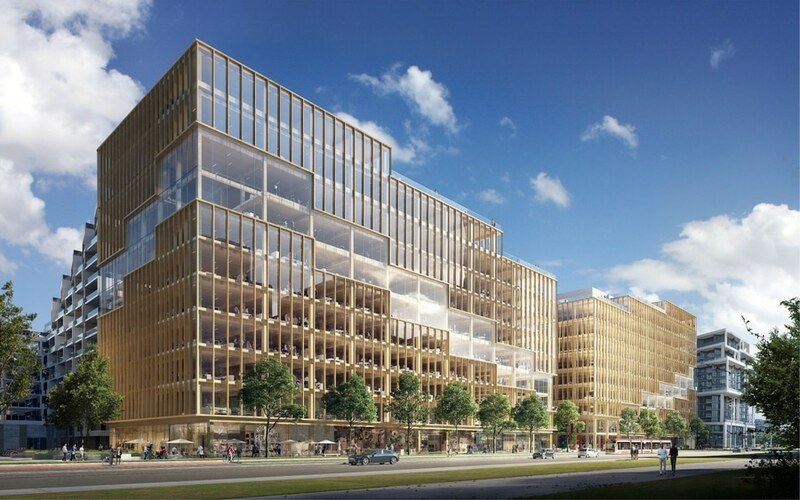 These office spaces can be directly connected to the lobby and help to activate the central plaza. Diagonal cuts in the building volume break the massing down to a more human scale around the plaza, and build back up to city scale as they rise across the façade. 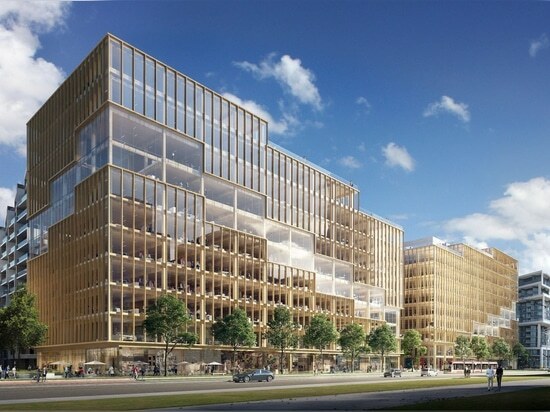 Source and images Courtesy of 3XN.